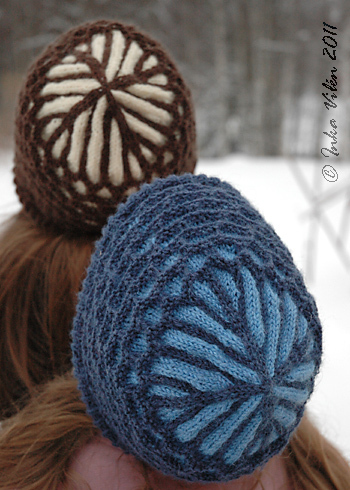 In Ulla 2/2009 (released in July) there were two patterns that immidiately caught my eye. The first one was Vaapukka by Kristel Nyberg. 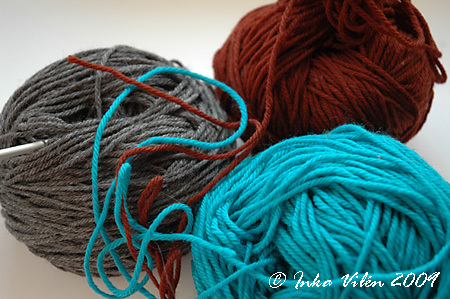 I happened to have five skeins (à 50 g) of Novita Bambu I had bought in a sale. 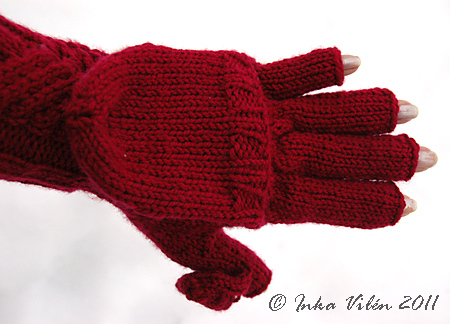 Novita Bambu is 68% bamboo and 32% cotton, very soft and lovely to knit, unless you split the yarn with the needle. Needles used were 3 mm and 3,5 mm. 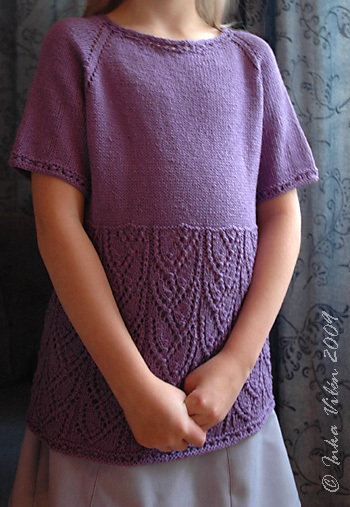 Since the top was knitted from top to bottom, I could easily try it on and add extra length. Aimed for the size ~140 cm, so hopefully the kid will not outgrow it in a rush. It took a bit over four skeins to finish this top. 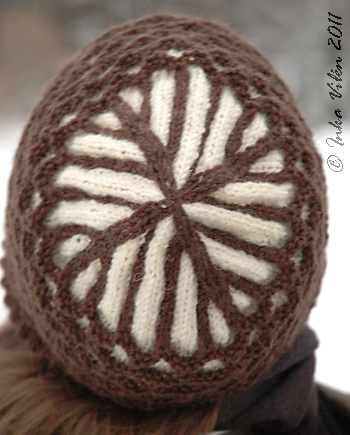 Vaapukka is a simple, yet beautiful pattern. 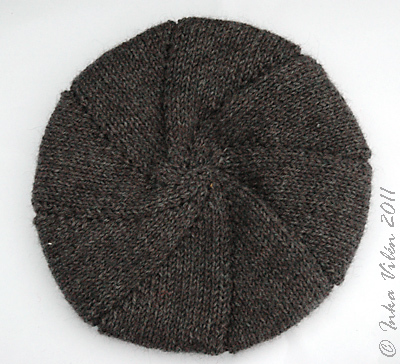 It was relatively fast to knit, though the yarn was on the thin side, but – as usual – it took me a few months to give the finishing touch (this was one project in my “project finish all the 95%’s”). 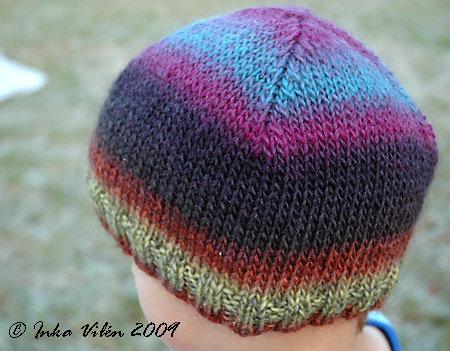 Started this one right after the Ulla 2/2009 was released, and got rid of the ends of the yarn last week. 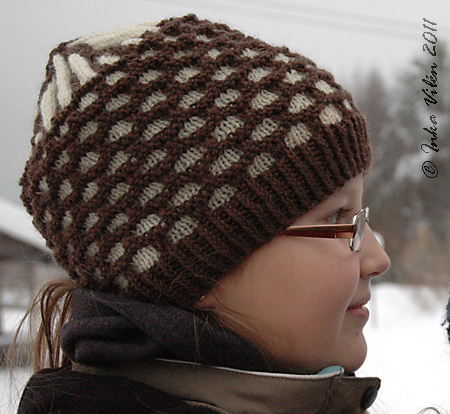 The second pattern I queued right away was Pellavapolku by Seija Puusaari. 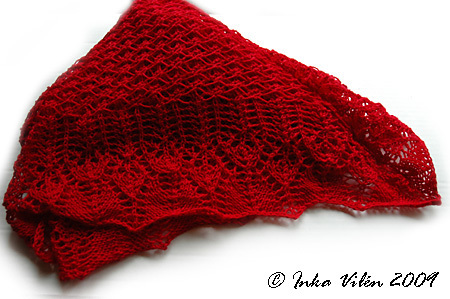 The pattern was made of linen, but I had no use for a shawl made of linen. 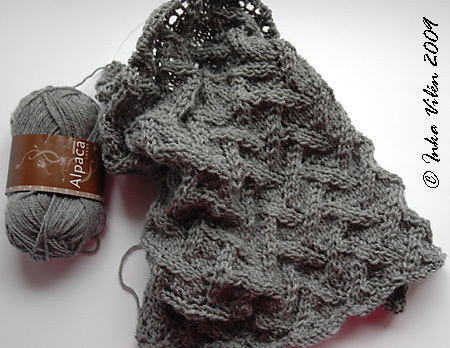 Saw some Novita Luxus Alpaca in the store, and thought that it would make a nice lacy shawl. 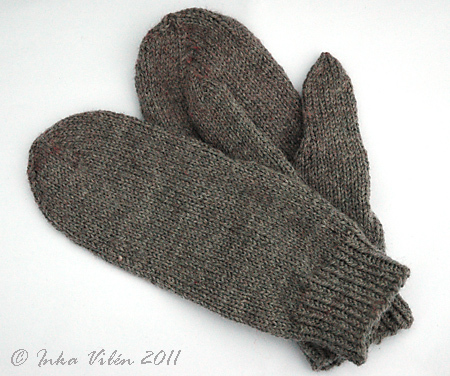 The yarn is 100% alpaca, very soft and lovely to knit. So this project has been called “Alpakkapolku”. Bought four skeins (50 g), thought that would be enough. Finding the right size needles was a process of trial and error: started off with 3,5 mm, which is the needle size recommended for the yarn. 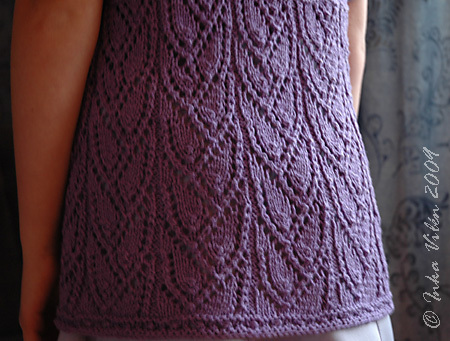 The lace pattern turned out wonderful – for a cardi. There was no lacy effect there. 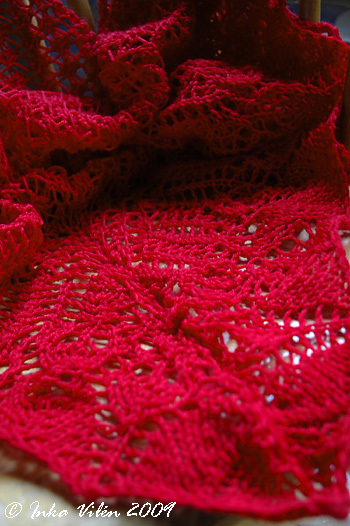 Finally with 6 mm needles the outcome was lacy enough (pictures both above and below are of the same needle size). Since knitting a rectangular shawl is quite monotonous, I knitted this a bit now and a bit later, in between other projects. By the time I was running out of yarn, I thought one more skein would do no harm. The lace in the both ends was a drag. The first end was ok, but the second… I knitted up to the point where I thought I’d have enough yarn for the lace pattern. Started knitting the end, and realized that I would seriously run out of yarn. Ripped the end and a bit of the body, and had another go. Ran out of yarn again. Did some more ripping, and some more knitting, and thought of taking a shortcut with the final rows. Instead went and bought one more skein to finish off the final two rows. So the total amount of yarn was just a touch over five skeins, approximately 254 grams. Weaved in the ends yesterday, so this project was not buried in 95% for ages. Good for me! 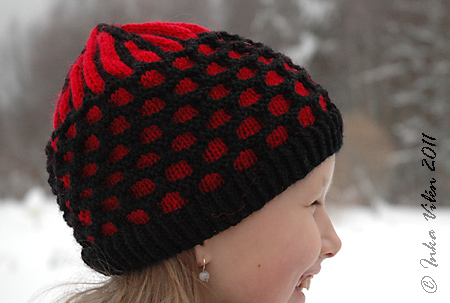 A few weeks back, I knitted two caps of Novita Puro for kids. Needed a quick and easy project for last Thursday – I had an afternoon of lectures to attend to. 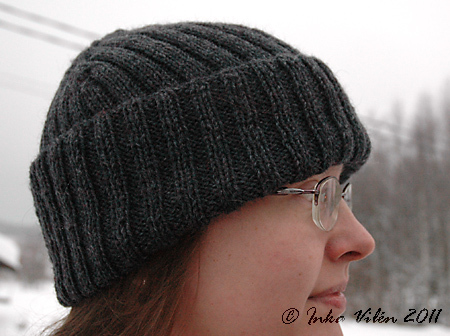 Decided to make yet another cap of Novita Puro, this time the yarn colourway was “Iltanuotio”. 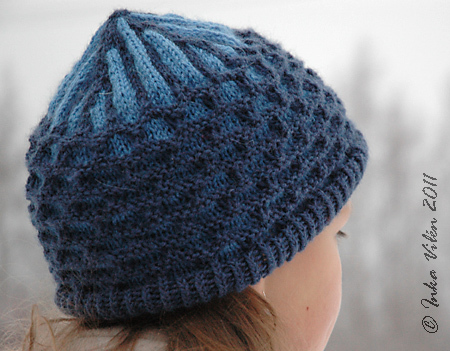 There were some nice colours in that yarn, but most of the cap turned out to be dark grey. Fortunately the target group didn’t mind. 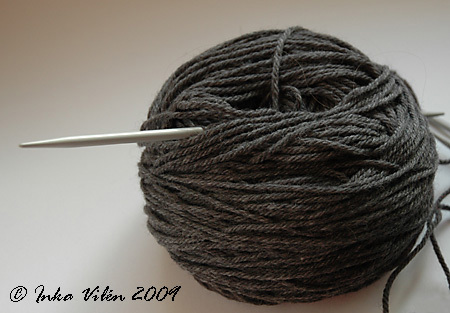 Yarn Novita Puro “Iltanuotio”, needle size 5 mm. 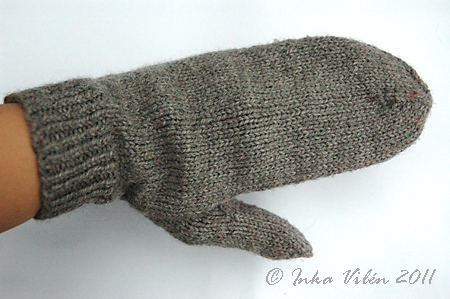 Knitted with magic loop. Quick and easy project. I’ve been in a process of finishing 95% UFOs. Glad to announce that I’m almost there: I have three items crossed off the to-do list. 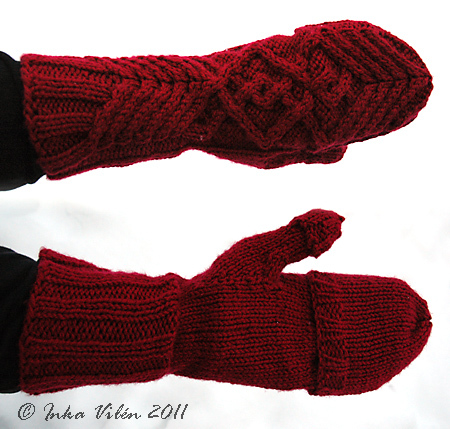 In August 2008 I started knitting these wrist warmers. Found a “fake cable”, which requires no cable needle, in a pattern book and adapted it. 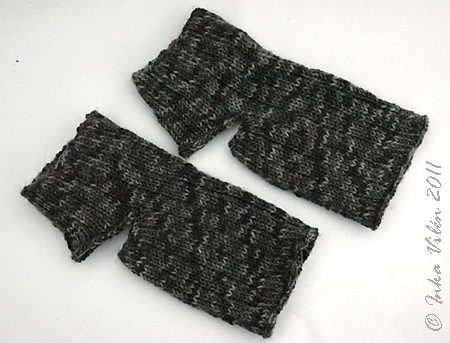 First made wrist warmers for myself. 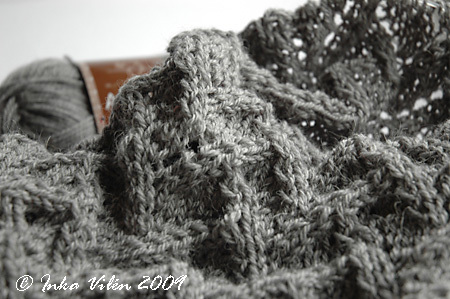 Yarn Novita Luxus Wind, soft and comfy – loved knitting it! Needle size 4 mm. 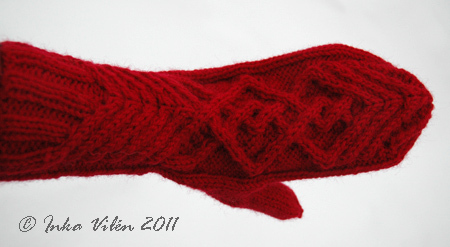 Casting on the stitches required three needles to make it strechy enough. 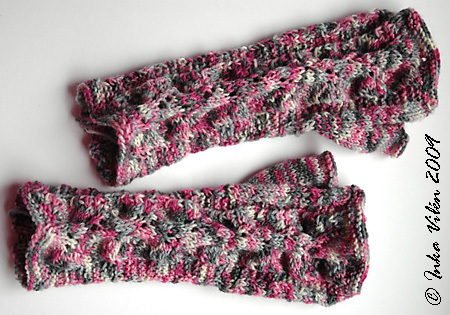 Second pair of the same pattern: wrist warmers for a kid. Yarn Novita Wool, needle size was probably 3 mm. Another UFO that has been lingering on a long time. 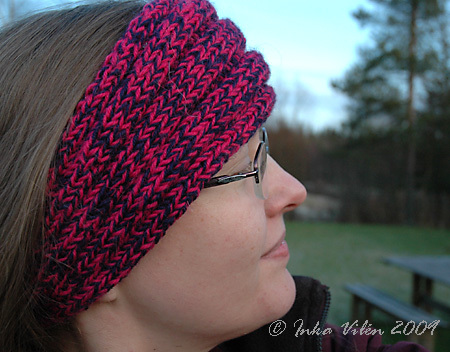 I made a headband following loosely the pattern of Headband in Alaska by Garnstudio. 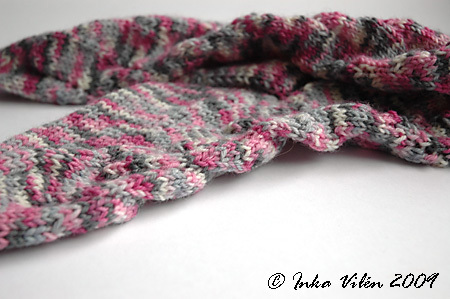 The yarn is Novita Nalle in two colours, pink and dark blue. Picked the colours to match my coat. 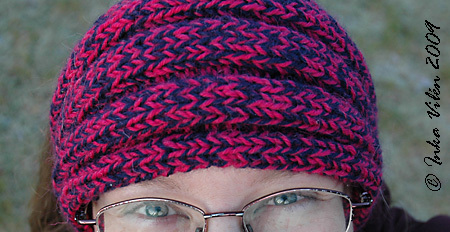 Knitted the headband in February 2009 into 95% shape, and the buried it in my “almost-there” basket. I was quite sure this would turn into a complete disaster just like any other headband I’ve made. Wearing glasses make most of the headbands, caps and other garments fit poorly. To my surprise, this was quite comfy and nice fitting. Might have to make another one to match other coats. 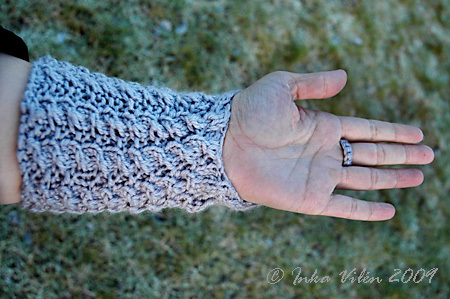 I saw Villapeikko‘s Pikkuveli-cardi in her blog and fell in love with it right on. 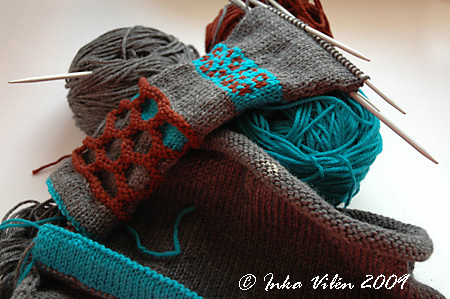 Villapeikko intended to make a pattern of this cardi, and I voluntered to test knit. That’s right: trying to decide on the colours is a drag. 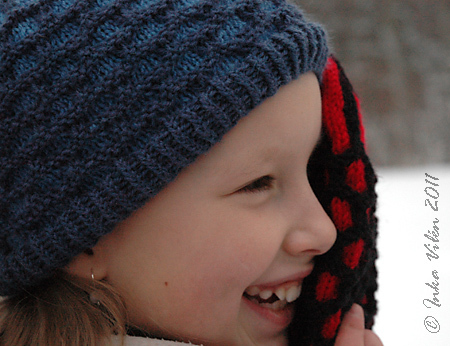 Fortunately the kid to whom I’m knitting this, knew exactly what colors this cardi will be made of. 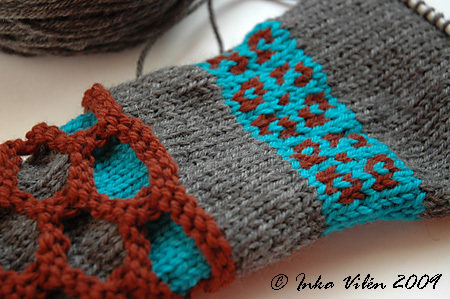 Must confess, though, that the idea of combining this shade of brown with grey and turquoise came from Katja from Secretwool. She was kind enough to give her opinion of a few alternatives I had. Started off from the hem, because I casted on this project while listening to a lecture. The sleeves required more attention, so I wanted to start them in peace and quiet. I just love the neatness of the hem and the contrast colour! 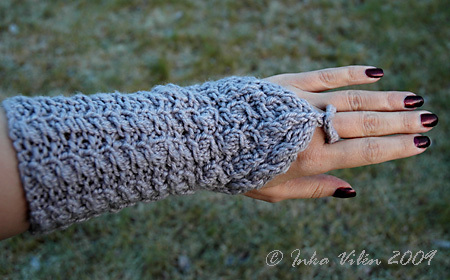 Sleeves really caught my eye when I saw the pictures in Villapeikko’s blog. The use of colours and contrasts was intriguing. The sleeve pictured here is the tryout number one. 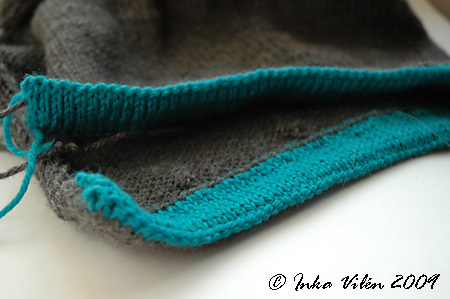 I did some frogging and Villapeikko did some excellent refining on the pattern of the sleeve, and now the proportions are perfect for bigger sizes. After somewhat intensive, though not overwhelming, week of knitting, I’m now halfway through the second sleeve. Next weekend, I believe, I should be up to the point of joining body and sleeves and starting the raglan decreases. Coming up in the next episode: Pikkuveli-cardi proceeds. This shawl caught my eye right on. 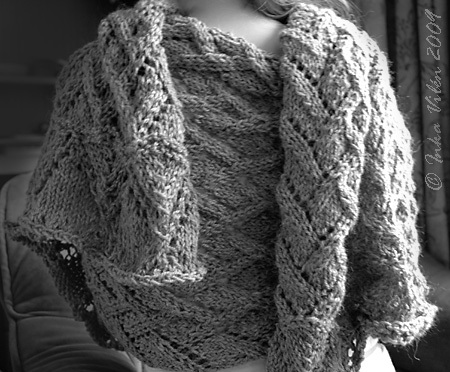 I had never knitted a triangular shawl starting in the middle of the neck, let alone casting the knitting from some crochet stitches. Vilma Vuori‘s Sagittaria was bit of a challenge. I found the pattern relatively straight forward, once I got the hang of it. The pattern of the body of the shawl took me a while to figure out, how and where it is repeated. 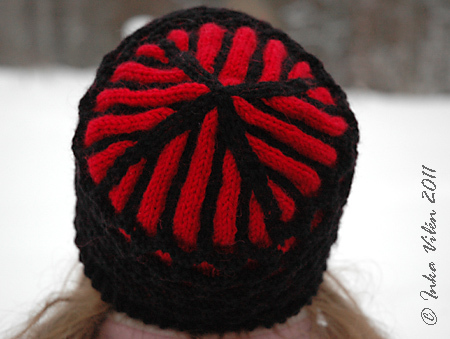 Once I figured out the repeating system, it was fairly quick to knit. 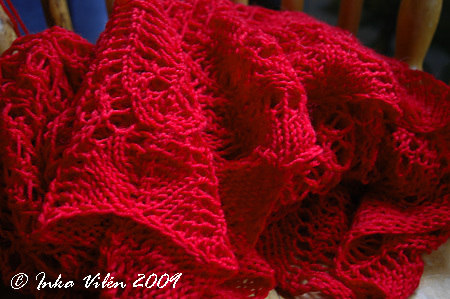 Wanted to make this shawl in red. 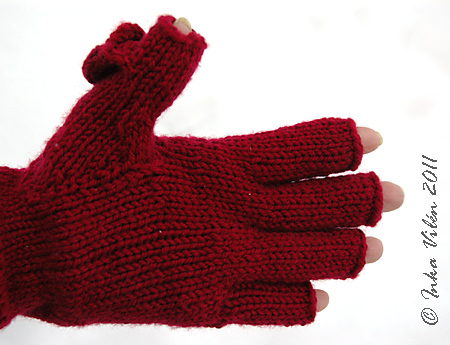 Found Novita Wool, 100% wool, in red. There’s just a touch of blue in the colour, and the yarn in actually not as bright as in the photos. I needed almost 4 skeins, each 50 grams, to finish this shawl. I repeated the second chart eight times instead of seven, that was recommended in the pattern. Used needle of size 5 mm, but I made the casting off with 7 mm needle to make it loose enough, yet even. 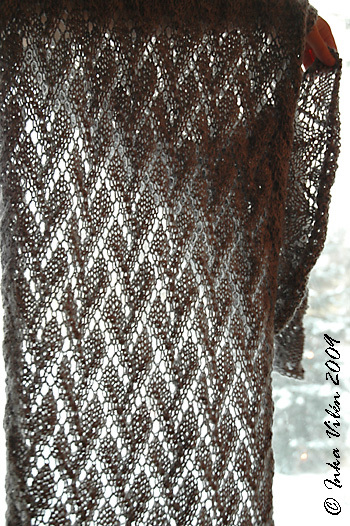 Blocking this shawl wasn’t all that easy, and I didn’t get the arrow-like edging to stand out arrow-like. 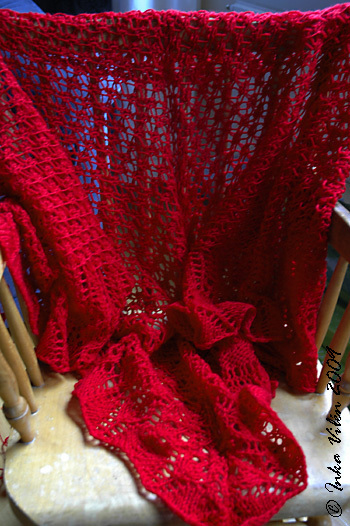 The shawl was more or less finished by September 14th – of last year. I only had the one yarn used in the casting off to weave in. Now that I’m in the process of getting rid of the 95% ready items, I finally cut the yarn and weaved it in. And I didn’t give another though on the tightness or looseness of the cast off. So here it finally is: finished Sagittaria. I have quite a lot of Novita Nalle in my stash, because it’s inexpensive and available. Over the years there has been a number of beautiful colours there, especially in Novita Nalle Colori. The colour I used in the following items is definitely my favourite, a mix of pink and grey and white. 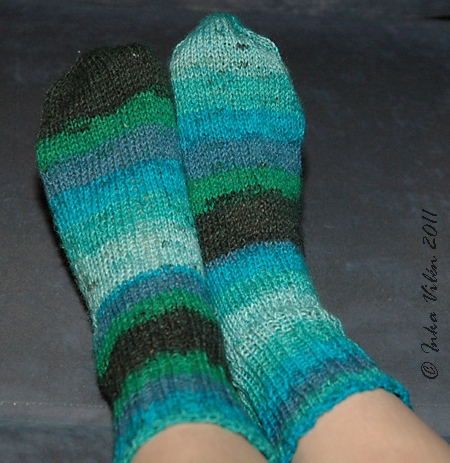 Halfway through August I saw these socks in Knitty. 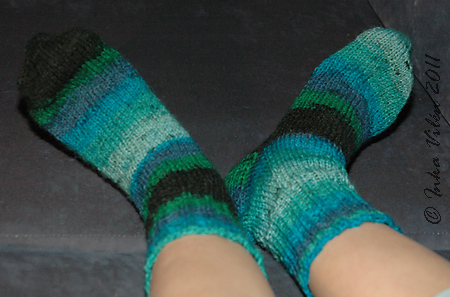 I’m not a fan of socks and sock knitting, but these Sunday Swing socks (pattern by Kristel Nyberg) looked so fabulous I wanted to knit them. 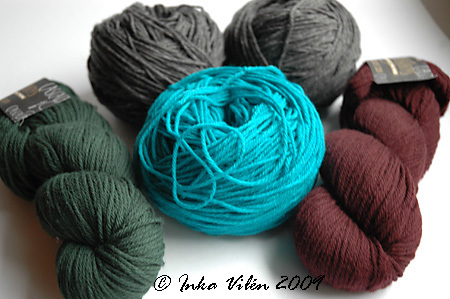 Picked out some Nalle Colori from my stash and needles of 3,5 mm. My yarn is thicker than in the model, so I needed to do some recalculating. 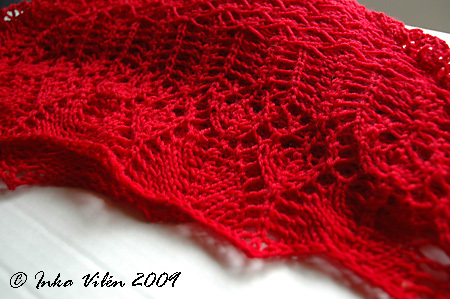 48 stitches -> lace pattern 2 stitches smaller than the smallest one in the pattern: 2st row k4 2tog k6 yo. Heel flap 24 rows -> 12 picked up stitches from the side. Heel turn -> 1st row instead of k16 knitted k12 (sl1, k12, SSK, k1 -> left 8 stitches unknit, and on 2nd row placed the 2tog accordingly). 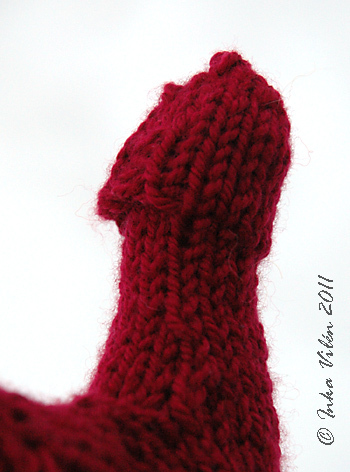 Gusset decreases until back to 48 stitches. On foot the lace pattern was repeated 4 times (including gusset decrease rounds). Toe decreases every second round until 8 stitches per needle, then decreases on every round until 2 stitches per needle (the same as in the smallest size in the pattern). The sock fits nicely in my foot, though perhaps the toe part is just a bit too long. 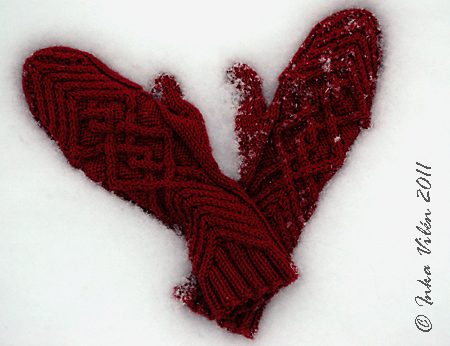 I just loved the pattern and knitting it! Knitting took me a couple of days, but getting rid of the ends of yarn… well, I did that last night. I’m sure these socks would look better if I blocked them, but hey, these are just socks. I’m not into knitting them and I’m definitely not into blocking them. I’ll just wear them as they are. 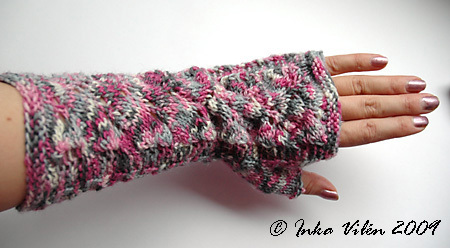 There was still quite a lot of yarn left of the first skein, so I thought I might make some wrist warmers. These colours suit perfectly to my light coat of old rose. 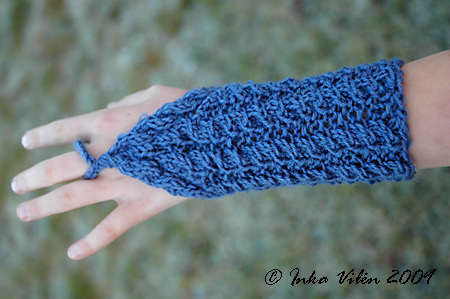 I decided to continue knitting with Kristel’s patterns, this time in Finnish from Ulla 02/06: Haruha wrist warmers. 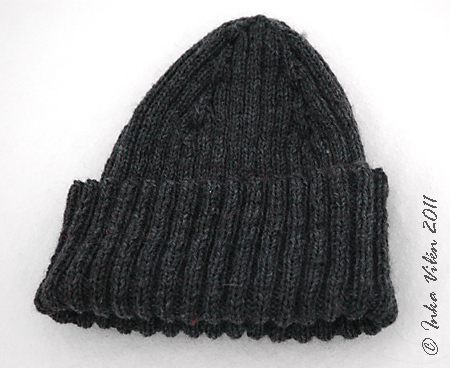 Knitted with 3 mm needles, as instructed in the pattern. 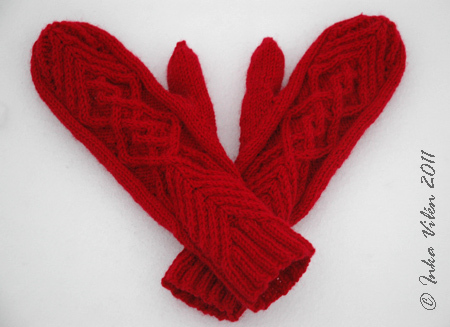 These turned out quite nice, even though I had to make the first few rows of the first wrist warmer at least five times before I got it going. Should have not started them when listening to a lecture. I still have about 900 g of this yarn. The plan is to knit a sweater for myself. One can never have too many sweaters that are pinkish and greyish and whitish.